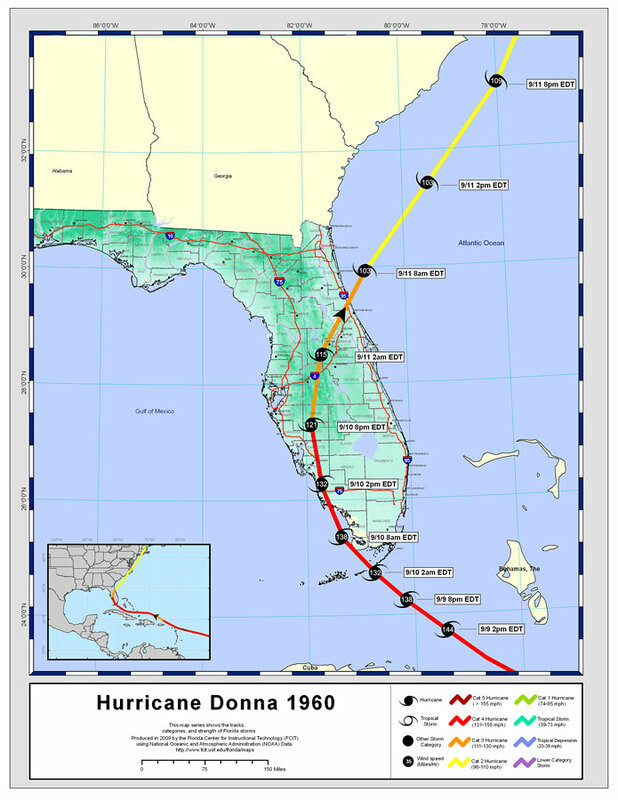 Description: This map created by FCIT shows the track of hurricane Donna in 1960. The legend shows the different categories of hurricanes as follows: Cat 5 (dark red), Cat 4 (red), Cat 3 (orange), Cat 2 (yellow), Cat 1 (green), tropical storm (teal), tropical depression (blue), and lower category (purple). Hence, the color changes when the storm changed categories. Also, the symbols show whether it is a hurricane, tropical storm or other storm category along the track. The data used for this map is from the National Oceanic and Atmospheric Administration (NOAA). This map also shows county boundaries, interstate roads, and some city names.